16mm at buckle end. No strap or watch included. New and unused. May have very minor surface wear due to storage. The original warranty is not in effect or attached. We should be able to resolve most problems. 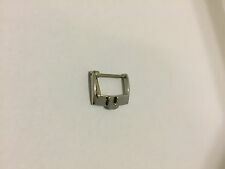 The buckle size is 16mm. Buckle only, Strap and/or Watch NOT included. Communication can help to solve 99% of the problems. Can fit a 13mm wide watchband. defect if not disclosed in the item provided. 18MM BLACK LEATHER BAND W/ STAINLESS STEEL SMALL LOGO BUCKLE. Color: Band color is black and buckle color is silver. 4.75" on the longer end and 3.0" on the shorter end. ALSO Included: Instructions for easy application. THESE ARE WATERPROOF! THESE PROTECTORS WILL NOT FALL OFF UNDER WATER! THEY ARE VIRTUALLY INVISIBLE ONCE APPLIED AND WILL NOT AFFECT THE LOOK OF YOUR BEAUTIFUL WATCH! 20mm at the buckle end. The condition is very good/excellent. The buckle has received a light polish. This buckle is 100% authentic. Buckle has been reconditioned (polished). Numbers from the buckle. Stainless Steel. 12 mm for Stainless Steel Bracelet. Material: Stainless Steel. Pre-owned Watches and Jewelry. Italy and Brazil have seen similar results. If you are. 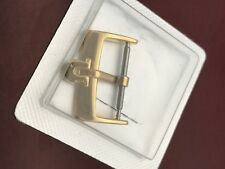 Genuine Omega Band 18x16mm flat BROWN Alligator with stainless steel buckle OMG. 1 item per order. The original warranty is not in effect or attached. We should be able to resolve most problems. We can answer. 1 item per order. The original warranty is not in effect or attached. We should be able to resolve most problems. -1 per order! Genuine Omega Band 20x18mm flat BROWN Alligator with stainless steel buckle OMG. The strap is 20mm at lug end and 18mm at buckle end. Leather band shows signs of use. Every watch is 100% AUTHENTIC. 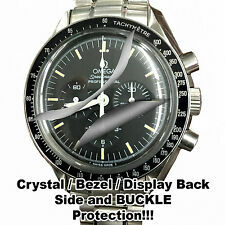 At WATCH-LIFE every watch has been examined and authenticated by our certified watchmaker. Marked 1455/452 on inside buckle. This will fit any of the 1455 bracelets. The buckle will fit bracelet 1504.826. We specialize in all your watch needs. If you are.